Walking down the toothpaste aisle at the local supermarket can be an overwhelming experience — especially if you aren’t sure what you’re looking for. When choosing the right toothpaste for your smile, there are a few important characteristics to take into consideration other than just simply your favorite flavor or the one that’s on sale. Mill Creek Dentist Dr. Brian Rutherford wants to go back to the basics and talk about a few of the things you should look for when buying toothpaste. Make sure your toothpaste has fluoride. Fluoride is an important ingredient that’s necessary for healthy gums and teeth, and has even been proven to protect tooth enamel from decay. In fact, according to the Academy of General Dentistry, brushing with a fluoride toothpaste twice daily can reduce tooth decay by as much as 40%. Look for the American Dental Association (ADA) Seal of Acceptance. Products that have the ADA seal have undergone clinical studies by the association and the claims, whether it’s cavity fighting or tartar control, are backed by scientific findings. Use a toothpaste that appeals to your personal preferences and needs. With such a wide variety of toothpastes on the market, it’s important that you find one that you like and fits your needs. Toothpaste not only serves to clean teeth and remove bacteria, but it can also help ease tooth sensitivity, whiten your smile, and control tartar. 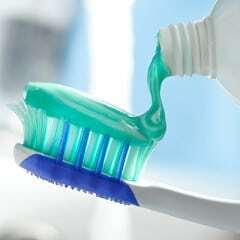 By selecting a toothpaste that has a flavor and texture you like, you’re more likely to use the toothpaste to brush the recommended two times a day. Using the right toothpaste is only a small part of an overall oral health routine. Brushing with a fluoride toothpaste twice a day and keeping up with your professional dental cleanings and checkups in Mill Creek are both important to maintaining good oral health. If you’re due for a cleaning or checkup, call our Mill Creek dental office and ask to schedule your appointment today.